I am executing below query in VB Demo. But VB Demo is crashing at the time of execution. I have checked the same query in MS Access & noticed that I accidentally type wrong column name in the join query. 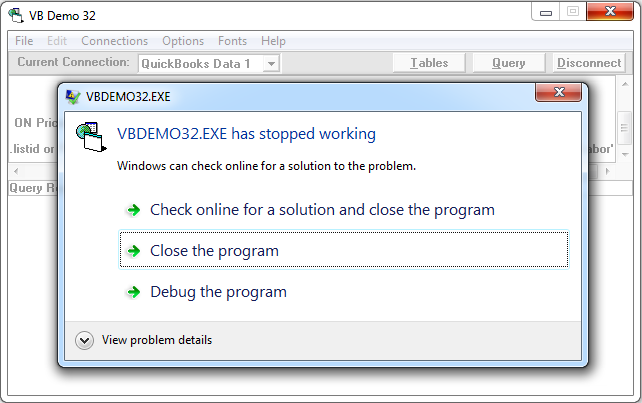 But MS Access does not crash only VB Demo is crashing. There is no space before "FROM" and before "LEFT" in your query due to this VB Demo crashing. Please add a space before "FROM" and before "LEFT" in query & test again VB Demo will not crash. Also, correct wrong column name in query & test again.